PhishMax - Digital Forensics, Cybersecurity, and e-Discovery | e-forensics Inc. It's official: the majority of data breaches result from Phished employees. And investments in hardening the perimeter and messaging environment fail to address the crux of the problem. If the employee is an extension of your firewall, the employee requires hardening as well, and that is what PhishMax offers: Hardening the Human Firewall. PhishMax is a managed services solution for employee testing and training that dramatically lowers your risk profile. Unlike do-it-yourself, subscription-based offerings, and other managed services providers, the e-Forensics team building the attack campaign scenarios, actually investigate phishing hacks. How does PhishMax Test & Educate? What is needed for a successful awareness campaign? A successful security awareness program is realized only when employees perceive it to be instilled into the culture. Security related education is the entire organization’ responsibility and the demands can be burdensome, but the returns come in many forms. 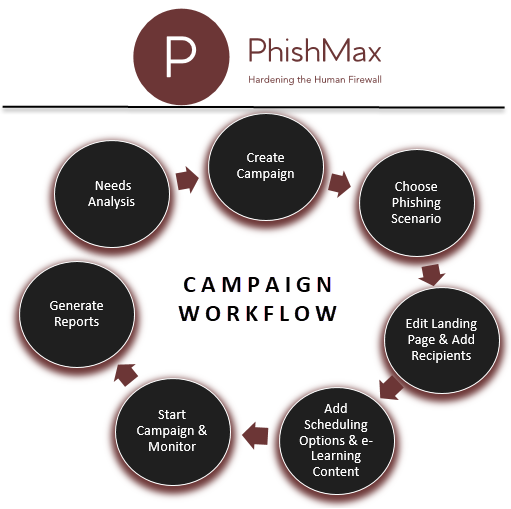 PhishMax contains hundreds of multi-lingual templates which are used to build tailored campaigns, for example, Phishing, SMiShing, awareness training or technical malware templates. Interactive training modules that can be rolled out based results of attack simulations, or simply ad-hoc. - Real time monitoring: opened emails, link clicks; positive attack, and more.